Dr. Claudia Jensen, professor at USC and a pediatrician who recommends medical marijuana for children with ADD, bipolar or other medical disorders. Transcript. The "Roast" of John Walters, Drug Czar of the Americas' visits Houston and asks for tolerance. Transcript of the "Roast". Citing evidence that shows zero deaths for patients properly using opioid medicines last year and 17,000 deaths from Tylenol, these doctors proclaim the drug war to be "mythology". Transcript by Philip Guffy. Emily Reilly, Santa Cruz City Council member. She is coming to Houston in support of "Project Housterdam" and will speak to our city council about the need for medical marijuana. Mitch Earleywine, Ph.D., is associate professor of psychology at the University of Southern California and author of "Understanding Mariijuana" (Oxford University Press); Bruce Mirken is communications director for the Marijuana Policy Project, based in Washington, D.C. Transcript by Philip Guffy. Frank Levine -Managing Editor XTRA Newspaper in San Antonio & Dr. Rick Doblin of MAPS . Frank Levine a journalist reports on experiences in Central America and Mexico on the drug war. Dr. Rick Doblin reports on a suit filed to allow for testing of medical marijuana. Tommy Chong, Denele Campbell, Goodwille Pierre, Dr. Claudia Jensen of USC, Karen Heikkala, Terry Hogg and a Drug Truth Editorial. Currently employed as warden of Texas' Holliday Prison Unit, Richard Watkins has called for an end of drug prohibition. We will discuss racial bias, the need for drug education and other aspects of this 89 year old drug war. Guests include Mary Lynn Mathre RN and Al Byrne of Patients Out Of Time who discuss the recent Cannabis Conference. Charles Thomas of the Unitarian Church discusses the recent Wash Post article on medical marijuana acceptance by many religions. Dr. Robert J. Melamede Ph.D. Chairman of the Biology Department of the University of Colorado. Comment: "The federal government is out of touch with modern, peer-reviewed science. The professional literature clearly shows that marijuana is a miracle drug and not the devil's weed. It is frightening to see the government's incompetence coupled with their disregard for liberty and a complete lack of basic human compassion." Steph Sherrer of Americans for Safe Access (ASA) will join us in studio as well. Harris Co. DA Chuck Rosenthal, the district attorney of the "Gulag Filling Station" will join us for the bulk of the half hour to discuss the drug war. Topics to include racial bias, knowledge of the genesis of this war, medical marijuana and the fact that he sends more people to prison than anyone in Red China, Russia or N. Korea. Our guests are the DA of Harris County, (Chuck Rosenthal) who sends more people to the death chamber and perhaps more people to prison than any person on earth. We'll have in studio, Tex. Rep. Harold Dutton and from UnlockYourVote.org, Ralph Garcia to talk of restorative justice. Ada Edwards, Houston City Council Woman, our first locally elected official will join us to discuss the "not credible" Houston Crime Lab. Also Joining us Al Byrne of Patients out of time and Chris Krane of NORML and Aaron Houston of the Marijuana Policy Project. The Drug Truth Network Program features in-depth interviews with US Congressman John Conyers comparing the Iraq abuses with US drug war prisoner abuses. We visit with Bob Newland and Jeremy Briggs, co-publishers of Hemphasis Magazine and we talk with Bill Piper of the Drug Policy Alliance regarding the June 4 vote by the US Congress to "defund" the DEA's attack on medical marijuana patients. International news and an extract of the Bill Good Show, featuring a panel of marijuana experts. Panelists include Keith Stroup of NORML, Eugene Oscapella from Canada, Kirk Tousaw of the Canadian Civil Liberties Assoc. and Peter Cohen from Amsterdam. Congressman Conyers, will join us today for the Cultural Baggage show. We will be discussing the comparison of the treatment of Iraqi prisoners with that inflicted on US drug prisoners. We will also hear from Eric Sterling of the Criminal Justice Policy Foundation and Noelle Davis of Texans for Medical Marijuana. Josh is writing, directing and producing a documentary film about the incarceration of Tommy Chong of Cheech and Chong fame. > With over sixty hours of footage of Tommy preparing to go into prison and an in-prison interview wherein he speaks openly about prisoners needing a voice. Tommy is in prison for conspiracy to distribute and manufacture drug paraphernalia. Eighteen months after a brutal DEA raid on a medical marijuana collective in Santa Cruz, California, the seriously ill collective members finally got the protection from future raids and harassment they have sought since filing suit against the federal government one year ago. Today’s ruling will protect the Wo/Men’s Alliance for Medical Marijuana (WAMM) while the lawsuit is pending, and allow the collective to resume cultivation. A reporter in Colombia for five years for Pacifica, the BBC, NPR and the Washington Post, among others. Routledge recently published his first book, "Walking Ghosts: Murder and Guerrilla Politics in Colombia", about a small leftist political party that was systematically destroyed by its right-wing enemies in Colombia. This event took place on April 1, 2 and 3 at Texas Southern University. We take a strong look at the fragmented and horribly flawed war of drugs and the racial implications of this 89 year old war on our own people. 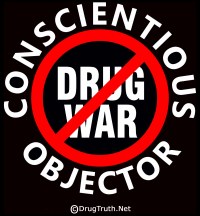 As a member of efficacy-online.org, Cliff has been requested to speak to hundreds of organizations about the harms of the drug war. Last month, Cliff returned from a several weeks journey to New Zealand, where he spoke before their Parliament and elected officials. We'll be sure to discuss the forthcoming Breaking the Chains Conference, scheduled for April 1, 2 and 4 in Houston, Texas. Mary Jane Borden is a stalwart of the DrugSense.org and is co-founder and treasurer of the Ohio Patient Network and fundraiser/strategic planner/grantwriter for DrugSense. She's an MBA and former president of the Columbus Chapter of Women in Communications and holds a professional Accreditation in Public Relations from the Public Relations Society of America. She spent nine years in the pharmaceutical industry as a market research analyst. The link to Mary Janes' "Chemical Bigotry". We will discuss the forthcoming vote in Alaska. This August, voters will decide whether or not to make possession of marijuana legal for adults. We will try to debate this issue with Alaskan law enforcement officers and medical doctors as well. Three anonymous medical marijuana patients tell us what it is like in the Gulag City of Planet Earth. To find medical support and medical marijuana in the "hometown" of George Bush Sr.
Nicholas Eyle, executive director of ReconsiDer, an organization dedicated to studying drug policy and looking at alternatives to the current U.S. drug policy. In this capacity he has spoken frequently at international conferences and written extensively for newspapers and periodicals. With help from the asst. warden at Coleman prison in Florida, we interview George about the fact that he is the longest serving, non-violent criminal in the United States. George was sentenced to life without parole after pleading guilty to possession of 2,600 pounds of marijuana. Please visit his website, appeal to the President for a pardon for George. During the last week of KPFT's pledge drive, we offer some current and past "best of" the Canadian look at the drug war and the war on marijuana consumers. Al Giordano, publisher of NarcoNews.com. We will discuss the everchanging, ever astounding events of South and Central America in regards to the drug war, the war of terror, and the war for democratic freedoms. Al will give us the latest, the real scoop on what's happening down there. Steve Bloom, editor in Chief of the brand new magazine, "Grow America" and Sr. Editor of High Times Magazine. Grow America will hit the news stands for this first time on this date as well. Be sure to join us as we talk about the history of High Times, the governments attempt to thwart the counter culture with their Operation Pipedream last year and the release of Todd McCormick and the imprisonment of Tommy Chong. Senior Servant and Founder, Metropolitan Interdenominational Church. Reverend Sanders’ church in Nashville, TN has outreach ministries in the areas of substance abuse, advocacy for children, sexual violence, and harm reduction, in addition to providing services to persons infected with, and affected by, HIV/AIDS through Metropolitan’s First Response Center, which Sanders founded in 1992. He is a pastoral counselor and a member of the Nashville branch of the NAACP, the Alcohol and Drug Council of Middle Tennessee, and the Ryan White Community AIDS Partnership. In 2002 Sanders was appointed by President Bush to serve on the Presidential Advisory Council on HIV/AIDS. Running for US senate seat in the state of California. Author of "Why Our Drug Laws Have Failed, and What We Can Do About It - A Judicial Indictment of the War on Drugs."